All current Spectrasonics instruments are compatible with 64-bit hosts. If your host sequencer is 64-bit-capable, we suggest you run it in that mode so you can access any RAM you have in excess of 4GB. 32-bit hosts can only access a little more than 3GB of Virtual Memory. To run your host in 64 bit mode, please locate the icon in your applications folder for your host. Right click (or control + click) the icon and then Get Info. 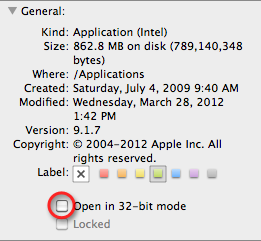 In the window that opens, please uncheck "Open in 32-bit mode"
Reopen your host and it will scan for 64 bit instruments. NOTE: Some current hosts, like Logic Pro X and ProTools 12, only support 64bit plugins.